I'd like to take a moment to tell you about the PAWsome first issue of Poppet magazine that I just finished reading - and let me tell you, it is so packed with activities that it took me a while to finish. It was so exciting to open the package and check out the free gifts included inside! My favorite was the totally tasty candies. 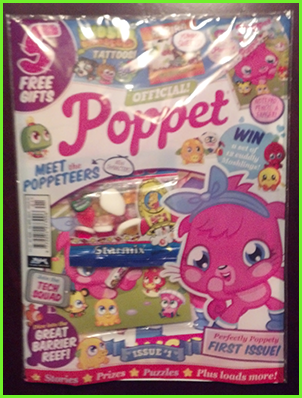 As I was enjoying the delicious candy I opened up the mag to get a glimpse into the world of Poppet and find out what fun activities awaited me. There are so many clever puzzles and super fun games to play and the best part is that they're all about Moshi Monsters! There's even a quiz to help you figure out which Poppeteer you have the most in common with. Speaking of The Poppeteers, one of the most exciting parts of this issue was definitely getting to meet all of Poppet's friends. Lucki, Serena, Juno and Zaffi all make a big splash in this issue. Lucki is such an amazing athlete, I love how she uses her special talents to teach the Moshlings how to stay active. Another of The Poppeteers is Juno who uses her special talents to help take care of the world around her and in this issue we get to learn some easy but effective ways to help make our planet a nicer place to live. Reading this made me want to be a bit more like Juno and care more for the swooniverse. Who knew saving the planet could be so simple and fun? 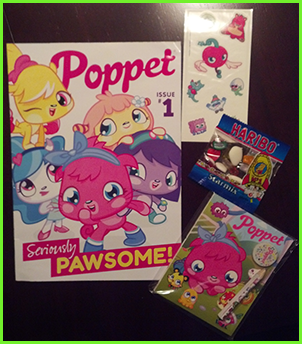 I had such a blast reading through the first issue of Poppet magazine that I cannot wait for the next one to come out when we get to learn more about Poppet’s friends! With this many fun activities, cool stories, puzzles and fascinating articles, what's not to love? The magazine is currently for sale in the United Kingdom. I highly suggest you go out and grab yourself a copy and tell all of your besties about it. Woah cool! Hopefully I can get Issue 4! Last edited by Lukey140701; 6-16-14 at 1:05 PM.